Global superstar Beyoncé returned home to Houston on Friday and joined the survivors of Hurricane Harvey at her home church, St. John’s United Methodist Church, with Senior Pastor, Rudy Rasmus - affectionately known to the global community as Pastor Rudy. Joining Pastor Rudy and Beyoncé were her mother Tina Knowles Lawson, daughter Blue Ivy and bandmate Michelle Williams of Destiny’s Child, among others who were on hand to provide support and aid to the victims of Hurricane Harvey, which has profoundly impacted the region. The Houston native and her foundation, BeyGOOD partnered with Pastor Rudy, the founder of the Bread of Life, Inc., a non-sectarian, non-profit organization, which started 25 years old ago through St. John’s United Methodist Church. The Bread of Life was set up to specifically respond to crises and disasters such as Hurricane Harvey. Beyoncé has previously partnered with her pastor on global outreach initiatives, including her highly-publicized anti-hunger campaigns and food programs in conjunction with her concert tours. “I’m home, this church is my home. I was maybe nine or ten years old the first time I sat there where my daughter [Blue Ivy] is sitting. I sang my first solo here,” she said, emotional as she spoke to a packed church. He noted that Houston has long benefited from many contributions made by Beyoncé and the extended Knowles family, including the Knowles-Rowland Center for Youth, which started in 2002 through St. John’s Church. “I often say that the Knowles-Rowland Center was built on Destiny’s Child hit single, ‘No, No, No.’ Destiny’s Child came through and help [Bread of Life] to build up a gymnasium as an outreach center for young people in our community,” says the pastor. With tens of thousands of people displaced and adversely affected by days of torrential rain and flooding in Houston and the surrounding areas, Pastor Rudy and the Bread of Life team have already begun outreach and recovery efforts. Hurricane Harvey is now considered one of the most devastating natural disasters in American history; with the damage spanning Texas and Louisiana, damages to date are estimated to cost more than $100 billion in clean-up and repair. The Bread of Life has set up a disaster case-management component to walk individuals and families through the process of getting back on their feet. The organization is now receiving support from all over the country, including donations of money and non-perishable essentials and supplies, including personal hygiene products, cleaning supplies, diapers, wheelchairs, blankets, pillows, and other items people we need for the long haul. Further, Bread of Life is providing temporary and permanent housing and financial support to many, and has coordinated disaster relief cleanup crews, ground transportation needs for individuals and families; cleanup kits; and household appliances. Displaced families will also have access to a tool bank, where they can borrow a variety of construction tools and do the necessary work on their homes themselves. How Will Houston Be Rebuilt After Harvey? The Bread of Life has prepared a Hurricane Harvey Recovery Guide as a resource for those impacted by the storm. The organization is also building and utilizing relationships in the mental health community for people who will experience post-traumatic stress disorder (PTSD) as a result of Hurricane Harvey. Though separate entities, both the Bread of Life and St. John’s United Methodist Church are committed to providing assistance and normalizing the environment for the people of Houston, the nation’s fourth largest city, as the recovery process continues. St. John’s United Methodist Church has church locations in both the downtown and the Northwest sections of the city. Pastor Rudy co-pastors with his wife of 32 years, Juanita; the couple are parents to two daughters. Culturally and ethnically diverse, St. John’s has more than 9,000 members with 95 percent being people of color. The congregants span every strata of the social-economics spectrum: 30 percent of its members own franchises or have lucrative jobs and positions; another 30 percent are struggling to get by, and another estimated 30 percent are transitioning out of homelessness, prison, or other precarious situations. In fact, the housing and health and human services divisions of the Bread of Life owns and operates three apartment buildings under the Temenos Community Development Corporation; these were specifically constructed for the chronically homeless, defined as men and women who have been homeless for at least a year. 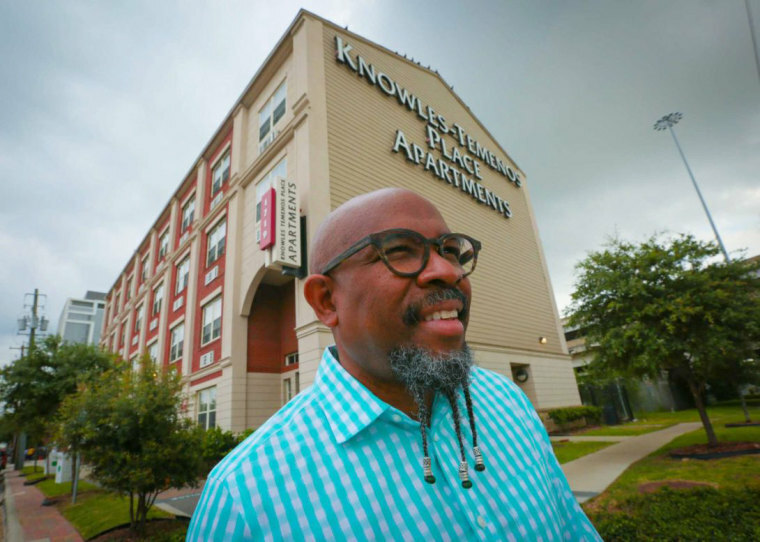 The first property built under the corporation is the Knowles Temenos Place Apartment, a 42-unit, single occupancy permanent housing unit financially supported by the Knowles family. The corporation constructed two other buildings with help from other donors. The second building is a $14 million project with 80 single units and the latest is a 15-single-unit apartment building. A global humanitarian and the host of the popular radio show, “Pastor Rudy’s Love Evolution,” which airs weekly on Sirius XM’s Kirk Franklin’s Praise channel (Sirius 64 – XM 33). He is the author of “Touch: Pressing Against The Wounds of a Broken World;” “Jesus Insurgency: The Church Revolution from the Edge” with co-author Dottie Escobado-Frank; and “Love Period: When All Else Fails.” Pastor Rudy is currently working on his fourth book, which will address the issues of privilege and scarcity, and is completing his doctoral work at United Theological Seminary in Dayton, Ohio. He previously attended Southern Methodist University’s Perkins School of Theology and the Houston Graduate School of Theology. Gwendolyn Quinn is an award-winning media consultant with a career spanning more than 25 years. She is a contributor to NBCNews.com/NBCBLK.com, BlackEnterprise.com, and Huffington Post, among others. Quinn is also a contributor to Souls Revealed and Handle Your Entertainment Business.